Prior to becoming the Minnesota Wild’s official practice facility, Treasure Island Center was a vacant department store and windowless relic of the past. The Saint Paul Port Authority and Hempel Companies partnered with Minnesota-based Collaborative Design Group to redevelop the building by breathing new life into the institution. The building’s pièce de résistance – the TRIA Rink’s west façade – offers sweeping views of the downtown that professional athletes, coaches, youth skaters, visitors and onlookers will enjoy for years to come. 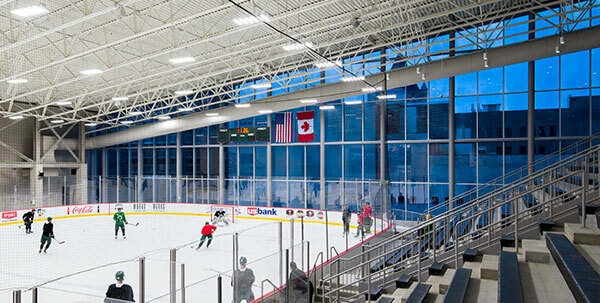 We spoke to Bill Hickey, Principal at Collaborative Design Group, about his role in designing the first-of-its-kind NHL training facility featuring SageGlass dynamic glass. Q: Why did you decide to install SageGlass on the west façade of TRIA Rink? What attracted you to the product? A: We had the unique opportunity to put an ice rink on top of a building in downtown St. Paul. The NHL has high standards for uniformity and ice consistency – it needs to remain at a consistent temperature, specific hardness, etc. Those types of things make installing a full façade of glass that close to the ice tricky. It would have been very easy from the rink perspective to put up a solid wall, but this was a huge opportunity to create an active presence in the city skyline for people all around downtown to experience. And we didn’t want to lose that view. The façade faces west, looking towards downtown, and receives a considerable solar load. We considered technical fabric shades, ceramic frit, films and other products, but SageGlass came out as the clear favorite and top performer. The product offers the best occupant experience and view, and its success in maintaining a comfortable, temperate atmosphere allows us to meet the NHL’s high-level performance requirements for the rink. Q: Were there any challenges during the installation process? A: SageGlass has a standard, smooth curtain wall installation. Aside from placing a few custom pieces, it went up easily, very quickly and without much trouble. Q: What was it like working with the SageGlass team? A: Working with the team was a lot of fun! The SageGlass representatives were very proactive in getting us any data that we needed. They understood that the idea of active glazing and dynamic glazing isn’t something that everyone intuitively understands, and they were helpful in explaining the product to our client and project decision-makers, providing us with samples, and giving a group of us a tour of their plant. Q: Has there been any feedback from the athletes about the dynamic glazing? What are the initial impressions? A: Everyone has been very complimentary. The glass transition and shading are so gracefully gradual that I’ve heard that there’s been some disappointment among the athletes in that they don’t even notice it changing! We love the natural experience the gradual fade provides. Frequently, people don’t notice the glass is changing until you prompt them. While it’s tinting, the glass provides nice, natural daylight exposure, even while transitioning to full shading. Q: How do you think the dynamic glazing will improve the athlete’s experience? A: The glass has worked so well, there haven’t been any particular concerns. When you look at other rink designs, no rink gets this much glass, especially this close to the ice. Many other rinks try to bring daylight in, but due to concerns with ice stability, it is rare to have the proximity of rink and ice to exterior-facing glass that we were able to achieve at TRIA. If we had not been able to find the right glazing product for this, we would have had to significantly reduce the amount of glass, losing the skyline presence – and the spectators and athletes wouldn’t be able to enjoy these views. To learn more about SageGlass in action, visit our portfolio page. SageGlass dynamically controls sunlight to optimize daylight, maintain outdoor views and enhance occupant comfort by preventing heat gain and glare. To learn more about TRIA Rink, click here. William D. Hickey, AIA, LEED®-AP, is the President and a founding Prinicipal of the Collaborative Design Group. The award-winning designer’s work in Design, Adaptive Reuse and Preservation, Interior Design, and Planning for public and private sector clients has been widely recognized. His work represents his focus on the design process and the integration of the natural and built environments.